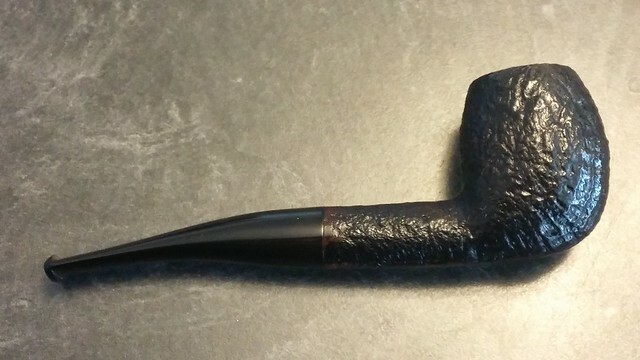 Here is the next pipe from the box of Blatter pipes sent to me from a piper in Iqaluit, Nunavut for refurbishment. 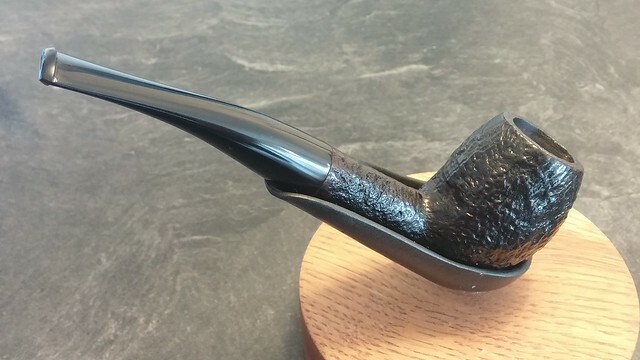 This one is a nicely shaped rusticated Bent Egg, stamped “Quebec 1989” over “Blatter” on the smooth underside of the shank. The stem is original and carries the Blatter Red Dot. 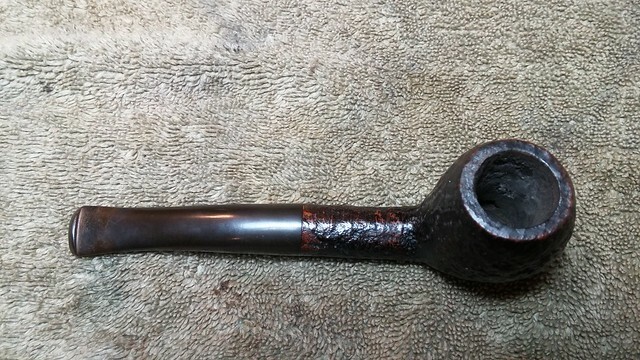 The pipe was in overall good condition, though it was time for a solid clean-up. There was a fair amount of carbon cake in the tobacco chamber, and a crust of tarry lava stuck in the rustication on the rim. 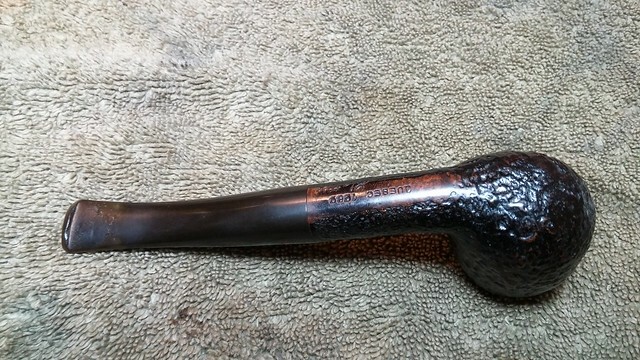 The finish was worn, especially on the sides of the bowl where the piper’s hands had rubbed the stain off the high points of the rusticated briar. 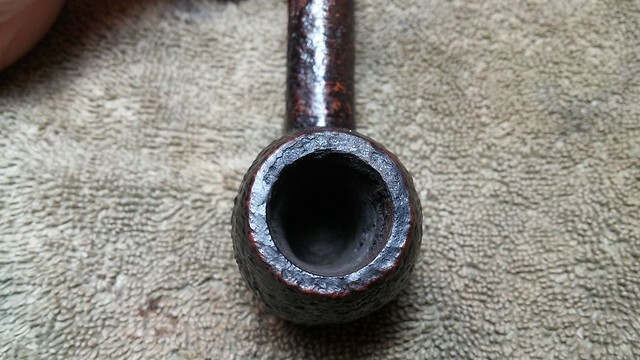 The stem was lightly oxidized, though several deep tooth dents in the bottom of the bit would need attention. I’d also have to address the stem fit as the tenon was loose in the mortise. While I had the stem in my hand, I ran a few pipe cleaners dipped in alcohol through the airway. It was surprisingly clean given the amount of cake in the bowl. 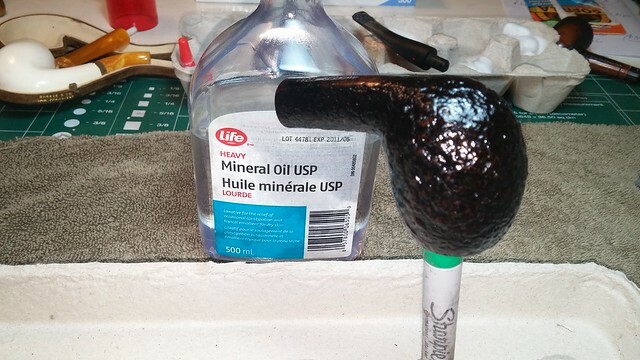 I dropped the stem into a bath of Oxyclean and warm water to raise the oxidation. While it soaked, I reamed the bowl. Thew walls of the chamber proved to be in excellent condition. 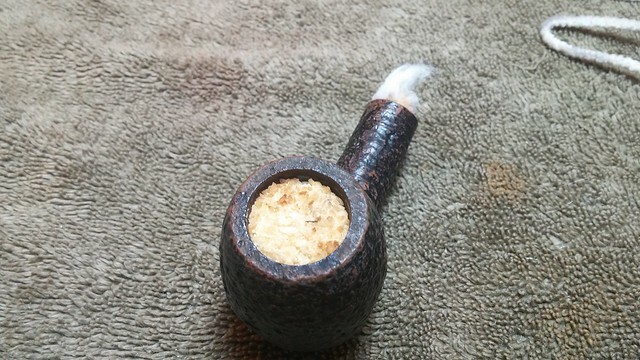 I used a brass bristle tire brush to scrub the lava off the rim of the bowl. 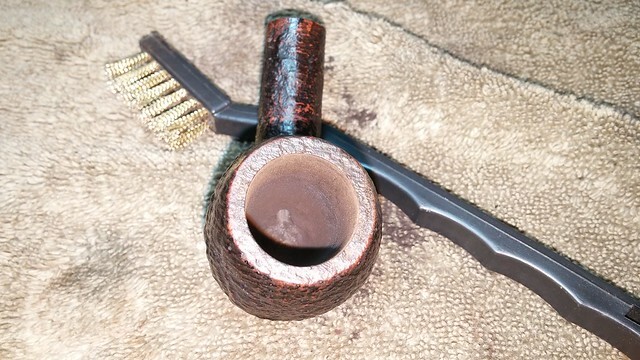 Brass is hard enough to lift the crusty tars but soft enough not to damage the briar. 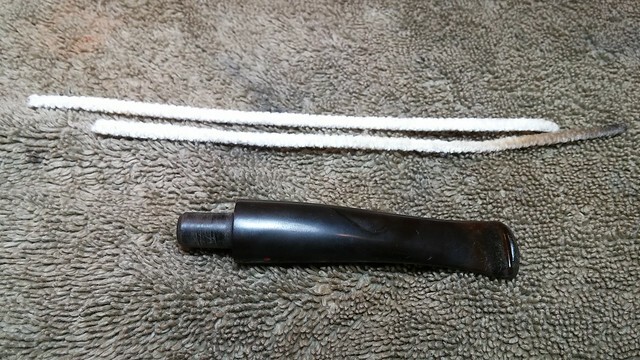 With the bulk of cake out of the stummel, I tidied up the mortise and airway with more pipe cleaners and alcohol. As with the stem, the airway here was remarkably clean. Murphy’s Oil Soap, scrubbed on full strength with a soft toothbrush, lifted the dirt and grime from the surface of the stummel, even reaching the oils and waxes at the bottom of the rustication. This pic shows just how faded the original stain has become over the years. 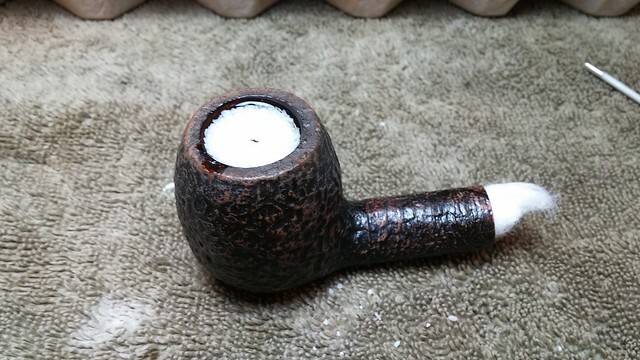 I finished up the stummel cleaning with a deodorizing salt and alcohol treatment. This drew out the remaining tars from deep inside the stummel. 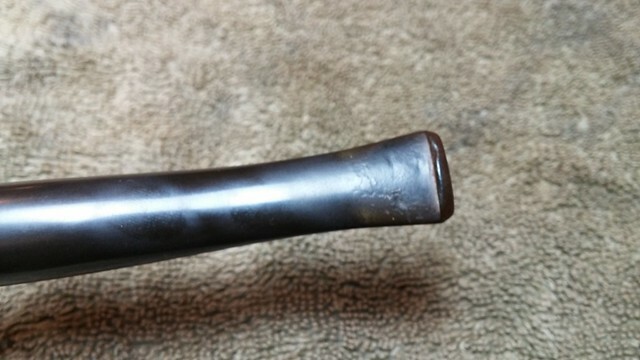 There wasn’t much here – this pipe was obviously well cared for. 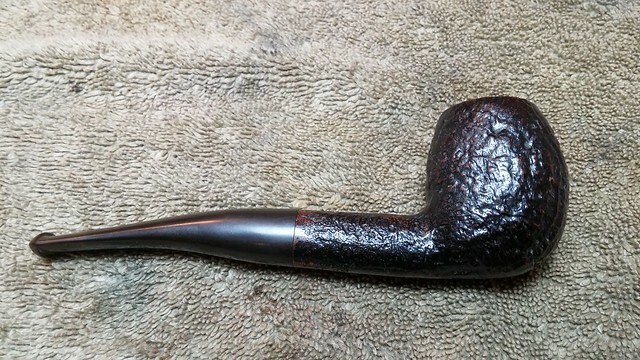 After dumping out the spent salt, I refreshed the stummel’s finish by applying a coat of Fiebing’s Black leather dye to the briar. 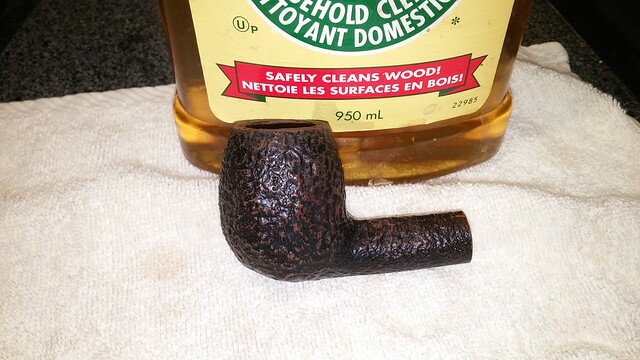 After the dye had dries, I hand buffed the stummel to remove the excess dye and revitalized the briar with a wipe of mineral oil. 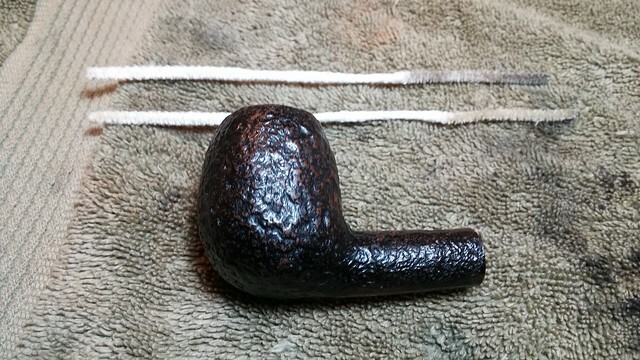 I set the briar aside to rest while I worked on the stem. 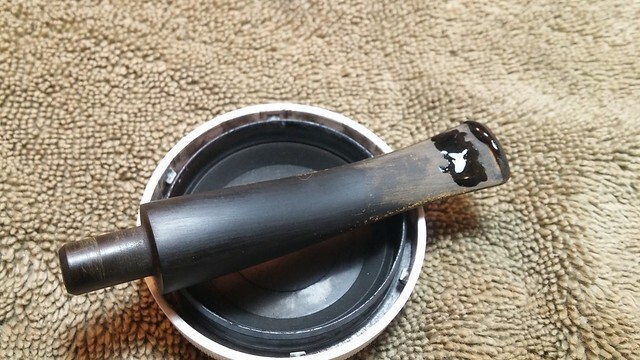 The Oxyclean bath had done its job raising the oxidation to the surface of the vulcanite stem where it was easily scrubbed away with 0000 steel wool and Magic Eraser. 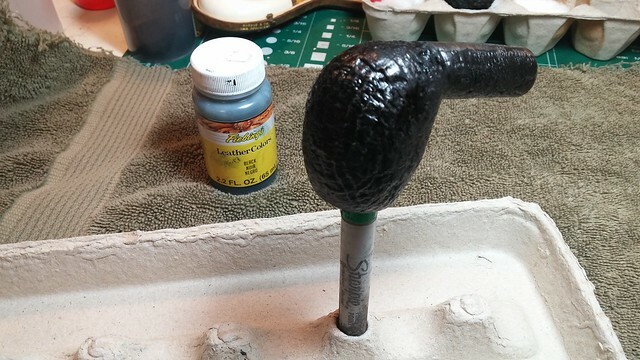 I used 220 and 320 grit sandpapers to smooth out the tooth chatter. The sanding also roughed up the area around the tooth dent, providing more grip for the patch I was to apply. 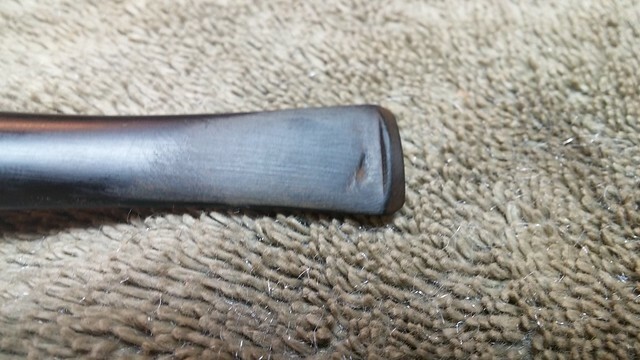 This pic shows the state of the tooth dent after sanding the stem. My stem patch material of choice is thick CA glue mixed with activated charcoal powder. I mixed up a batch and drop-filled the tooth dent, overlapping the repair area to ensure good coverage. I let the patch cure before using needle files and sandpaper to level and smooth the repair. I also took the opportunity to sharpen the leading edge of the button. To tighten the fit of the stem in the mortise, I expanded the diameter of the tenon slightly. 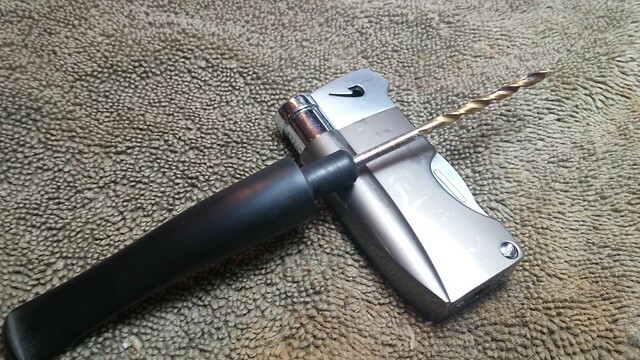 I warmed the tenon over a lighter flame until pliable and then pushed in the smooth end of a drill bit slightly larger than the existing airway. The soft vulcanite stretched to accommodate the drill bit, and when it cooled, the stem retained the new larger diameter. A bit of sandpaper tweaked the fit until the stem slid home snugly in the mortise. 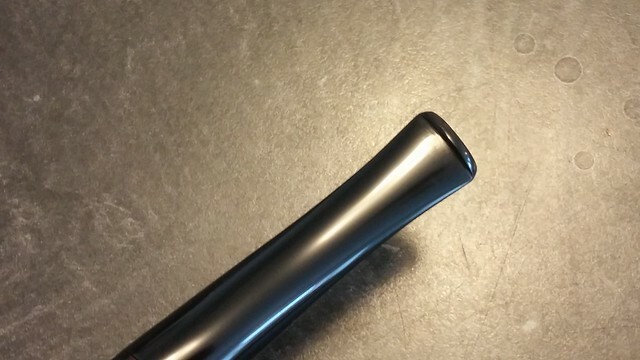 With the major stem work complete, I finished up by smoothing and polishing the stem. 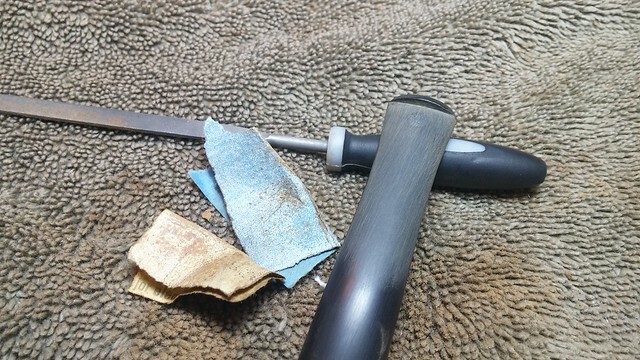 I have found that 0000 steel wool does a great job removing sanding scratches, so I only needed to wet sand with 600 and 1000 grit papers to bring back the shine. Buffing on the wheel will remove any remaining marks. Both stem and stummel received a light buffing with White Diamond compound on the wheel. 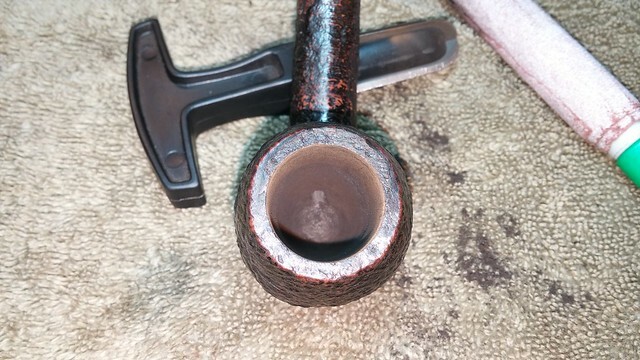 I buffed the stummel very lightly to avoid pushing compound into the nooks and crannies of the rustication, while the stem got a bit more time on the wheel to bring up the shine. 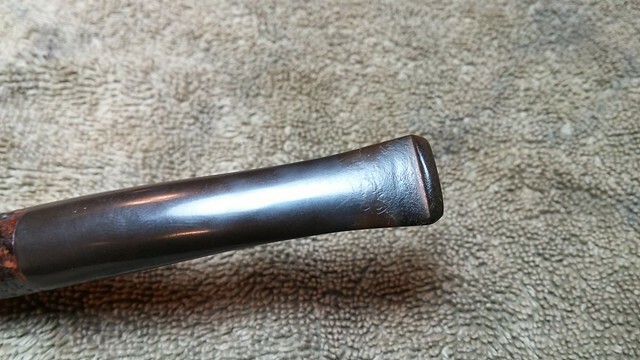 Then the entire pipe was treated to a touch of Carnauba to shine and protect. 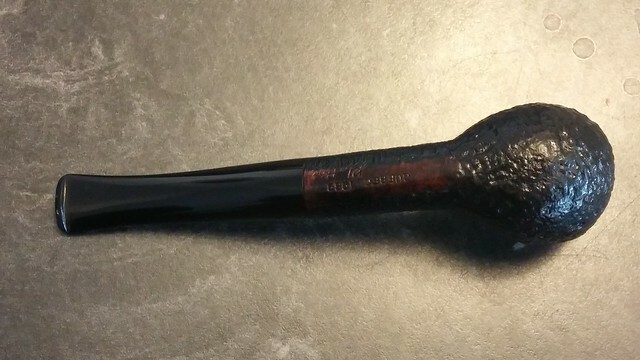 The finished pipe, refreshed and renewed, is ready to head back north to its owner where it will doubtless provide decades of loyal service. 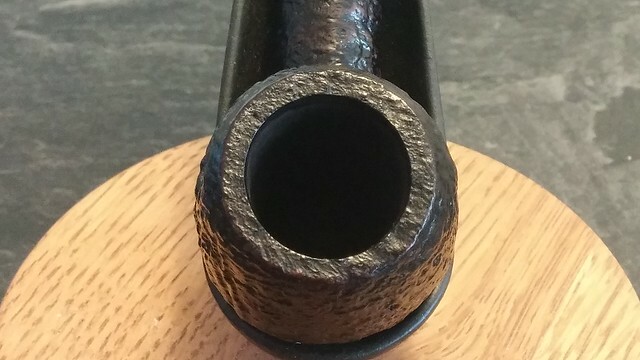 Working through this lot of pipes, I have developed a certain appreciation for the quality of Blatter pipes. 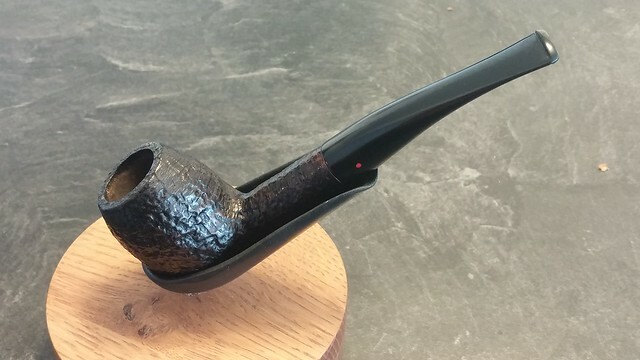 They are well made in relatively small numbers by dedicated craftsmen who pay attention to the small details that set a quality pipe apart from its more mundane brethren. I’m sure this Blatter Bent Egg will be welcomed home by its owner! Thanks for following along with me on this pipe journey. Until next time, Happy Piping! Great work Charles. 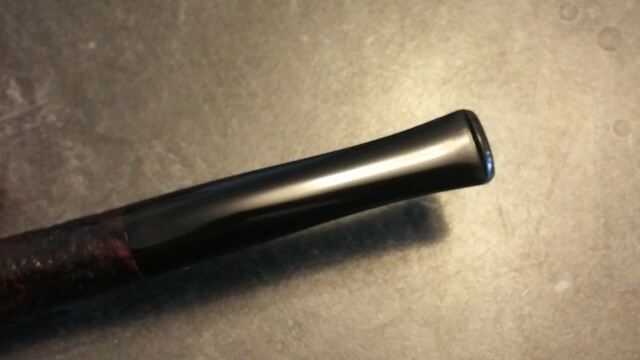 Can you tighten a acrylic stem in the same way? Thanks again, Jeff. Thanks Jeff. Acrylic stems will soften with heat like vulcanite stems so this technique will work. Just be careful not to overheat the stem as acrylic will blister/bubble if it gets too hot. Nice work Charles, to bad she isn’t up for sale. Considering where your customer lives, I’d say you did a very good deed. I’d be smoking and drinking all day/night up there. 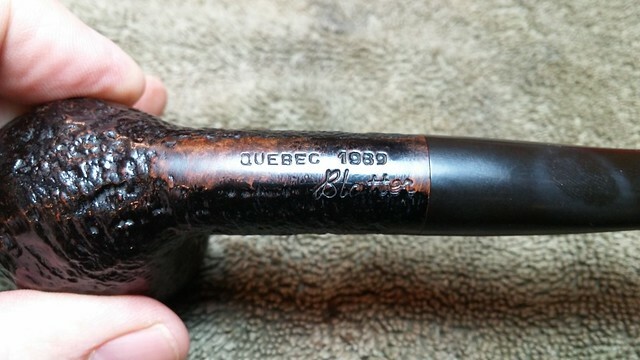 I am a big fan of Blatter & Blatter pipes. 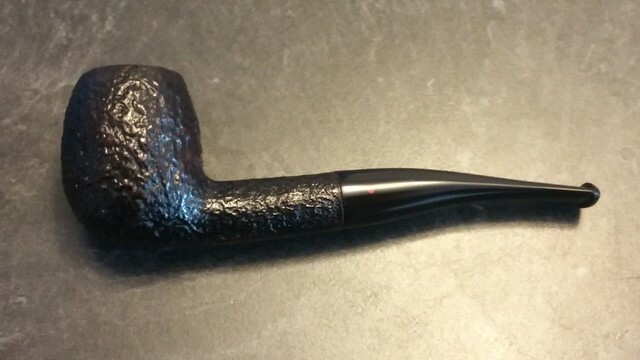 They do a great job making a classic pipe that is a great smoking pipe. 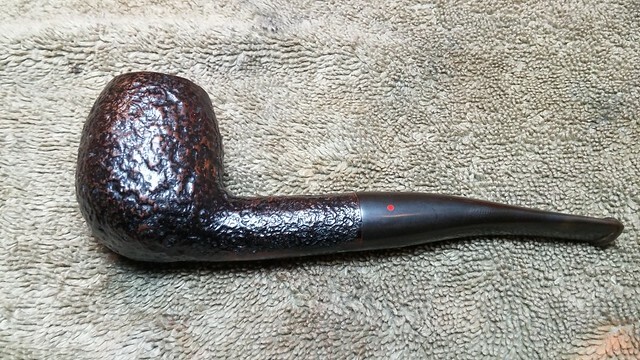 Charles did a great job on this one and gives a bit of history along with the restore. Thanks Charles. 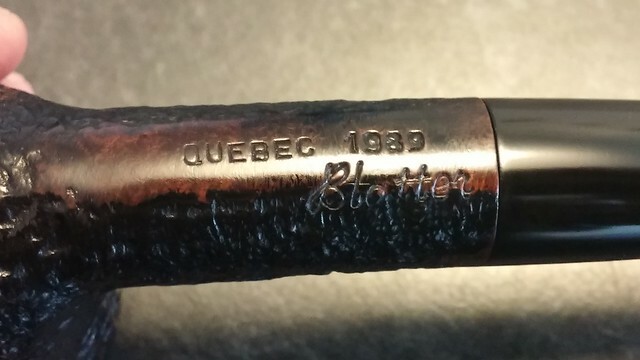 I still haven’t figured out what the “Quebec 1989” stamping refers to. My assumption is that it indicates made in Quebec in 1989, but that’s just a guess.